The beauty of Wayne Gretzky is for all the ethereal magic he brought to the rink—that dandy curl at the blue line, his private games of hide-and-go-seek behind the net—he presented something tangible. Beyond soft-focus memories, he left us numbers: 894 NHL goals; 2,857 points; four 200-plus point seasons; 61 NHL records. He was not merely the best hockey player. He was the most quantifiable. He retired in 1999. Eighteen years later, he remains hockey's most recognizable figure, suspending time as he once suspended disbelief. In celebration of Gretzky's 56th birthday on Jan. 26, 2017, here is a look through the years at "The Great One" off the ice. 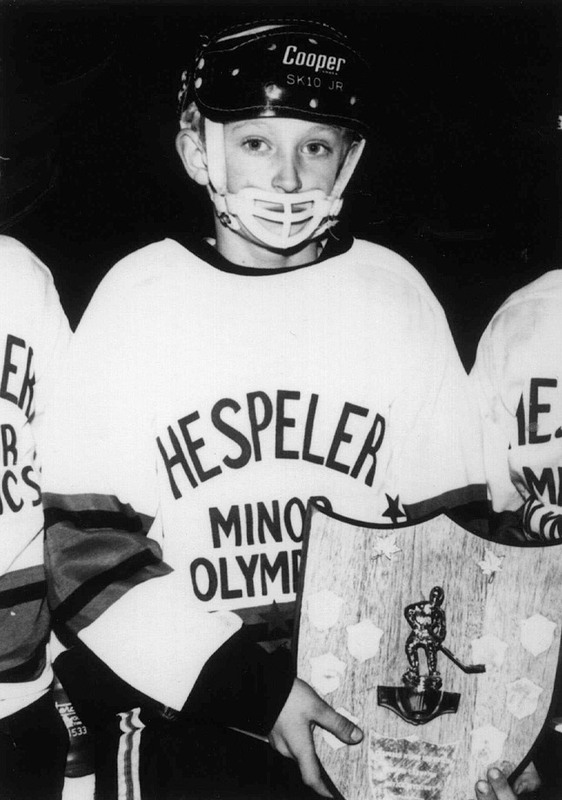 At age nine, Wayne Gretzky was a youth hockey phenomenon in Canada. As he progressed quickly from level to level and dominated against much older players, some newspapers called him "the next Bobby Orr" for his speed and skill. The future Great One laced up his first pair of skates and spent countless hours on a rink built by his father in the backyard of their home in Brantford, Ontario. By the age of five, Wayne was competing against kids who were 10 or 11 years old. 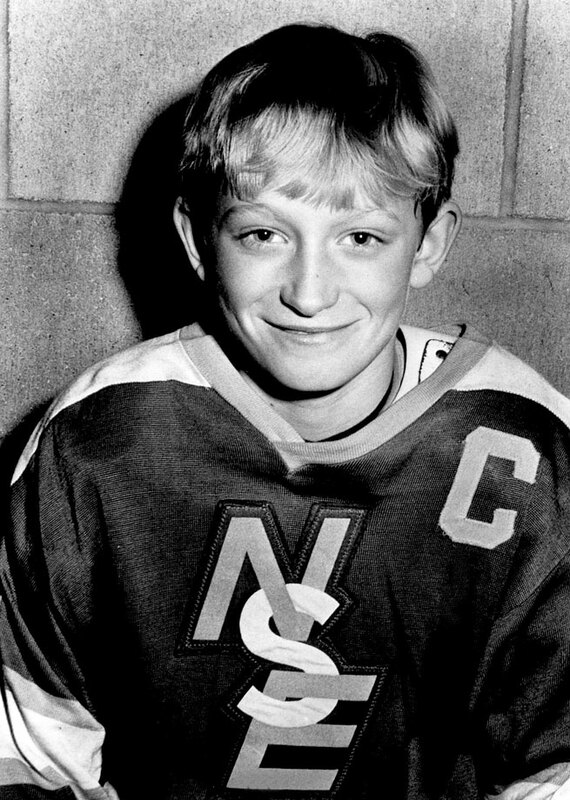 At age 11, Gretzky was running wild in his Pee Wee league in Brantford. Nicknamed "The White Tornado" for his white gloves and speed, he scored 378 goals ... in one season. 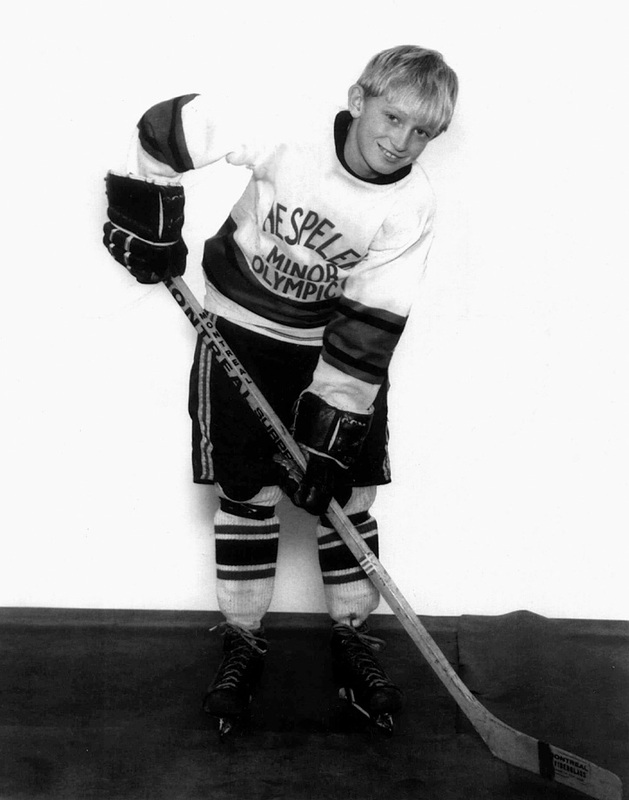 In one Pee Wee league game, Gretzky potted three goals in 45 seconds. "He would never come off the ice," recalls Darren Eliot, who played against Gretzky in the same league. "He moved to defense instead of actually taking a break on the bench." By age 14, the curly-topped phenom was a target of resentful parents in Brantford, some of whom cheered when he was injured during a game, so he moved to Toronto to play minor hockey for the Nationals. 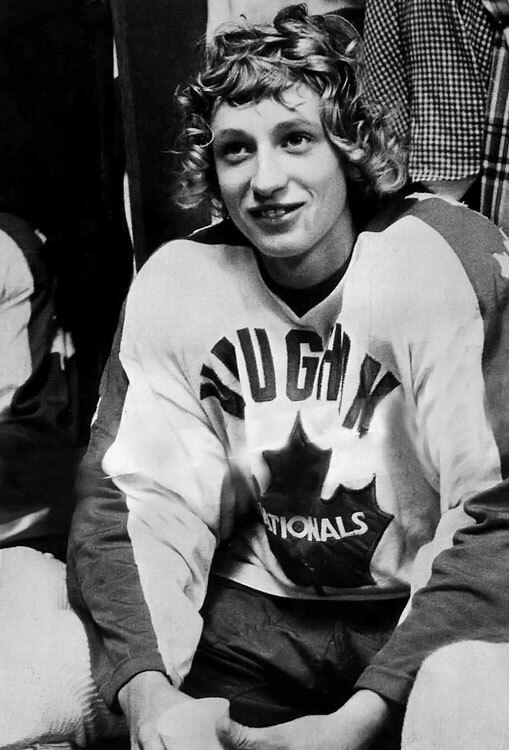 Gretzky, 17, scored 70 goals and 182 points in 63 games for the Sault Ste. Marie Greyhounds of the Junior A Ontario Hockey Association and was the youngest player on Team Canada at the 1978 World Junior Championship in Quebec City. (He lead all scorers with eight goals and nine assists in six games.) Despite his prowess and uncanny on-ice sense and vision, some scouts feared he would be too small to play in the NHL. 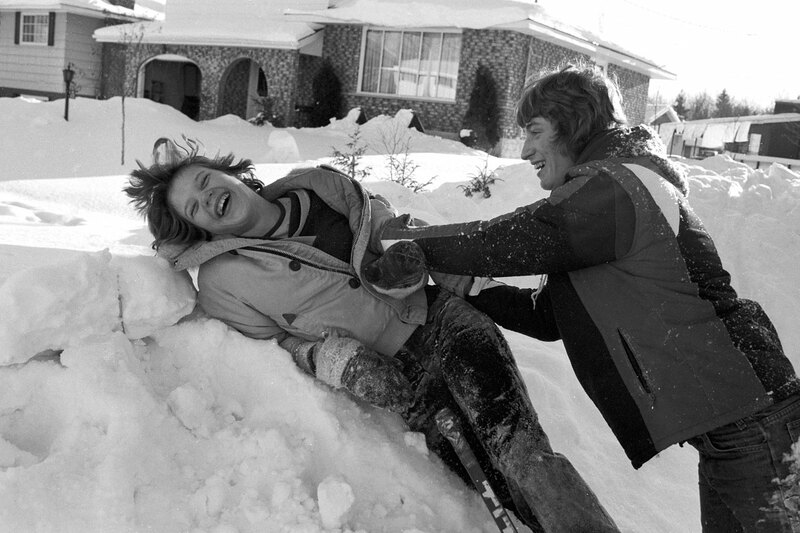 Gretzky lived with a local family while he played in Sault St. Marie, Ontario. Here, the 17-year-old enjoys a neighborhood game of street hockey. 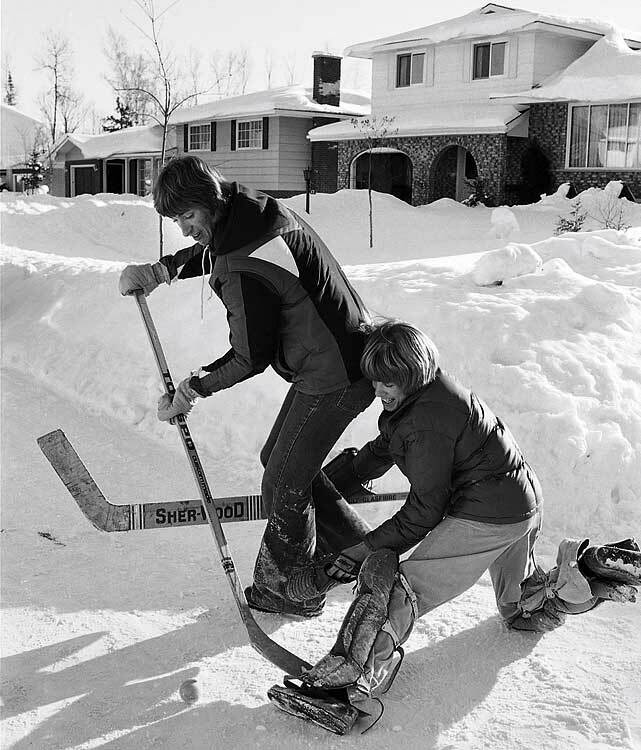 Gretzky throws a check, something rarely seen in his professional days, during a game of street hockey. 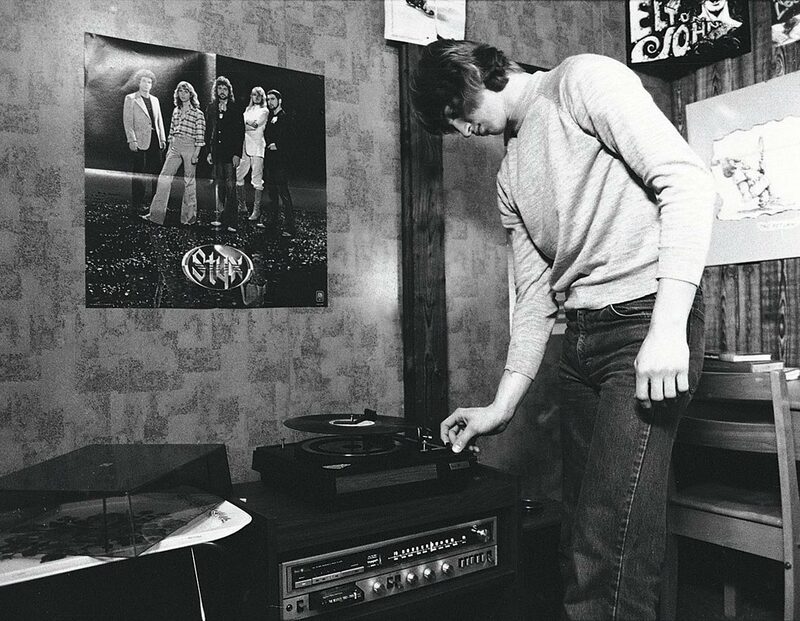 Obviously partial to the progressive sounds of Styx, the 17-year-old Gretzky spun some hot wax on his stereo in the Bodner family's house in Sault Ste. Marie. The teen phenom, seen here in his room at the Bodner family's house in Sault Ste. Marie, tried to keep up with his schoolwork as a pro career loomed. 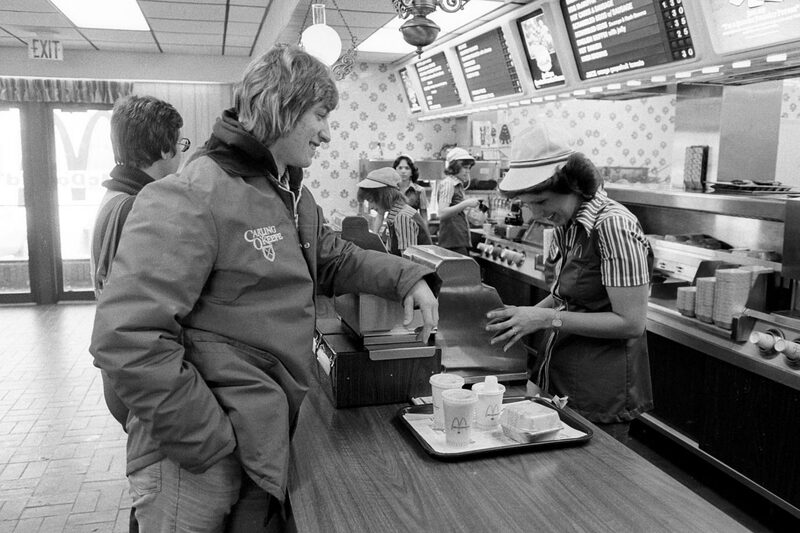 The future Great One grabs some grub at a McDonald's in Sault Ste. Marie. Gretzky would go on to sponsor numerous businesses in his pro days, including McDonald's. 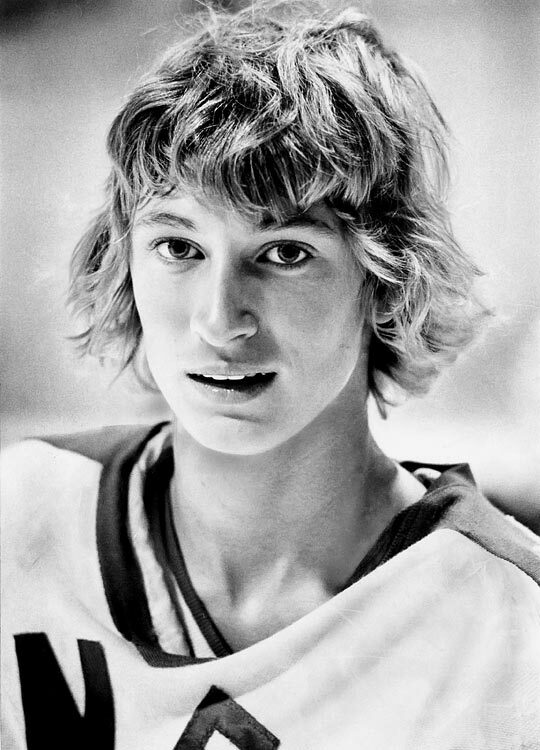 Gretzky had played only eight games for Indianapolis when the team folded. He was sold to the WHA's Edmonton Oilers, with whom he signed a 21-year contract worth $1 million per season on his 18th birthday. 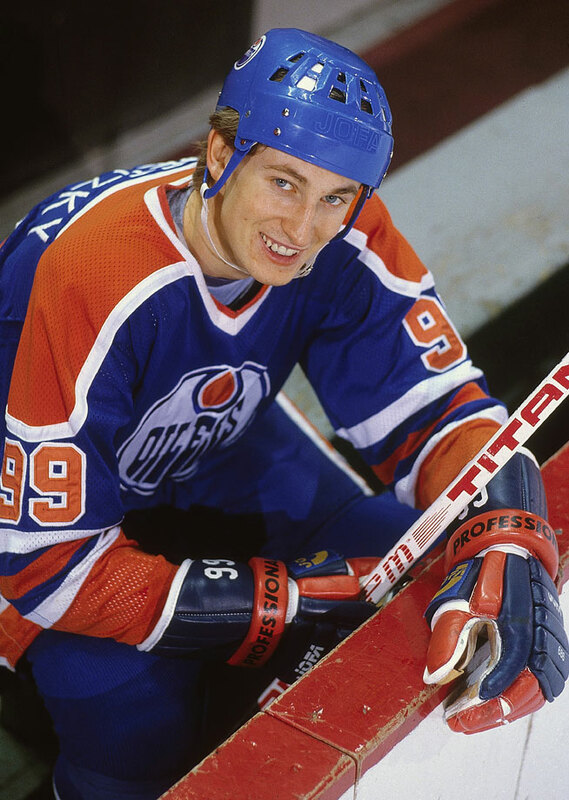 The Oilers were absorbed by the NHL later that year and Gretzky's accomplishments and legend would reach unprecedented heights. 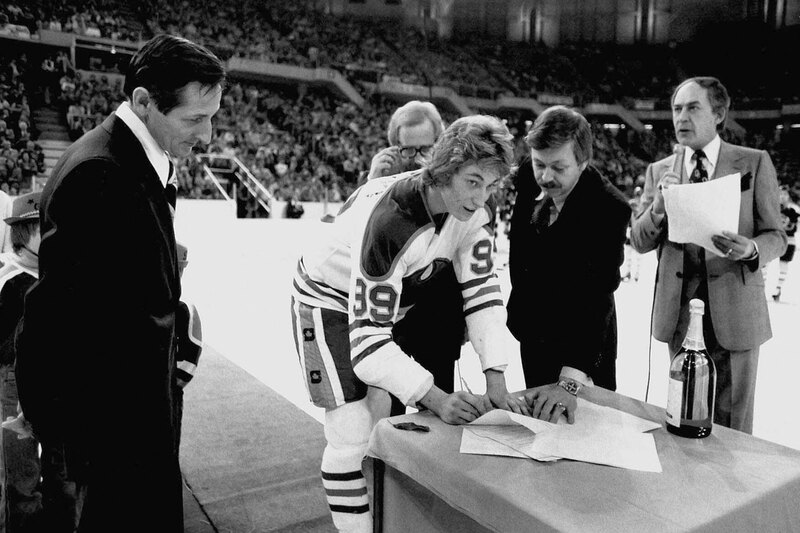 Gretzky had good reason to smile before the playoffs in '81. He would go on to score 21 points (7 goals and 14 assists) in just nine games that postseason, before the Oilers were eliminated by the defending Stanley Cup champion New York Islanders in the second round. Gretzky and the Oilers quickly became a force. Here, he playfully interviews two of his most notable teammates -- future Hall of Famers Paul Coffey and Mark Messier. 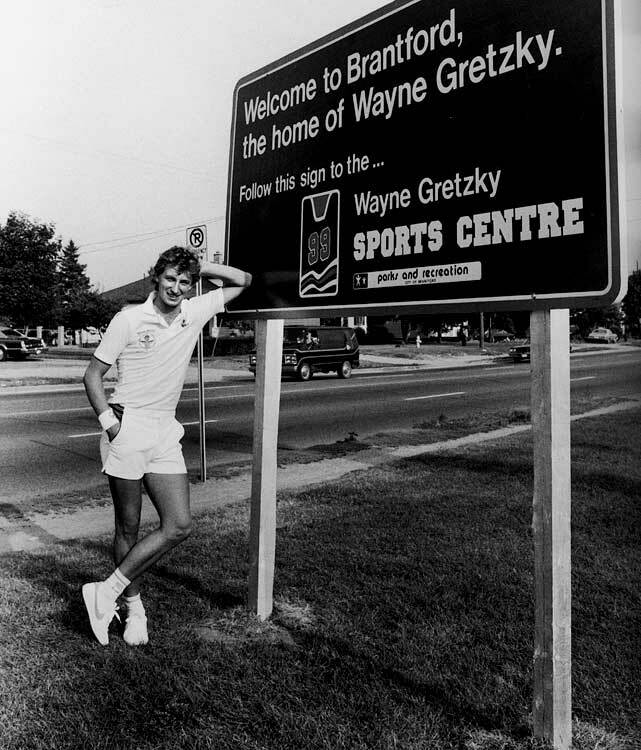 Only four years into his pro career, Gretzky had put his hometown on the map. One of the perks of fame is you get to hobnob with models. Here, Gretzky schmoozes with Cheryl Tiegs during his charity tennis tournament. The Oilers reached their first Stanley Cup Final in 1983, only to be swept by the four-time defending champion New York Islanders. Gretzky congratulated Islanders GM Bill Torrey, who told him, "Don't worry, kid. You'll be back next year." Torrey was right. In 1984, Gretzky and the Oilers dethroned the Isles in five games. Mr Bubble: The Great One parades through the Oilers' dressing room. By that time, he was routinely shattering scoring marks and his Oilers were becoming a dynasty that would win four Stanley Cups in five years. Gretzky married actress Janet Jones on July 16, 1988 in a ceremony that was tantamount to a Royal Wedding. 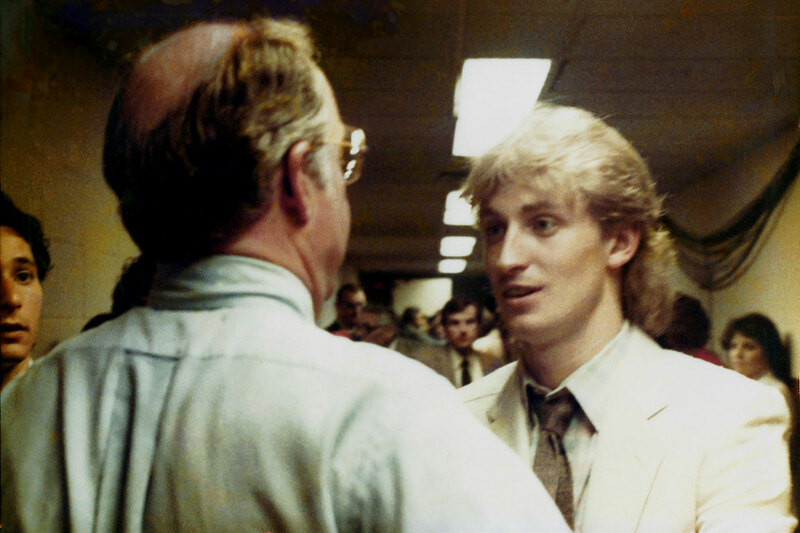 Gretzky's trade from the Oilers to the Los Angeles Kings in August 1988 was a landmark event for hockey in the United States. The Great One was welcomed to L.A. by Lakers superstar Magic Johnson. Wayne Gretzky holds his four-year-old daughter, Paulina, after a press conference in Inglewood, Calif., on Jan. 4, 1993. It was announced that the Los Angeles Kings team doctors cleared Gretzky, who hadn't played all season due to a herniated thoracic disk in his back, to return to the game. 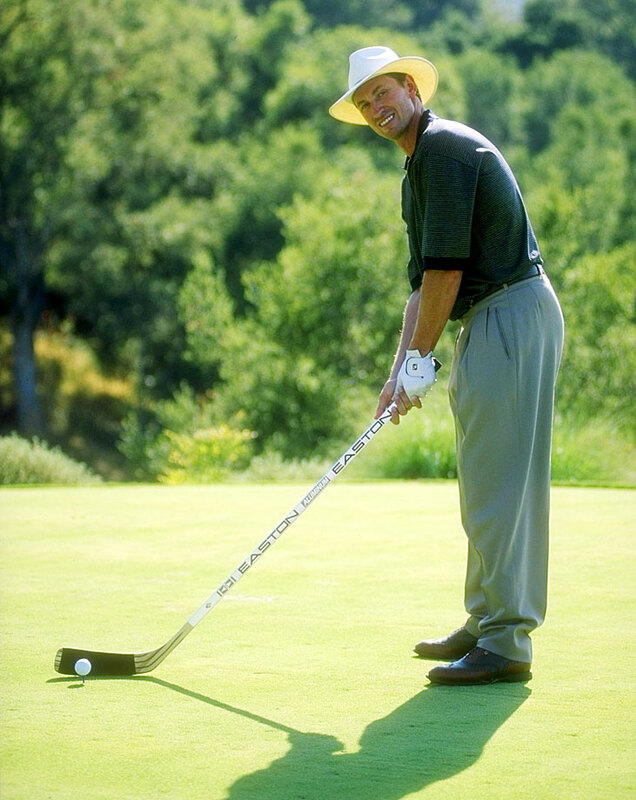 Gretzky lines up a shot during a golfing event in 1994, using a club he's more familiar with. Wayne Gretzky breaks quite the sweat in an aerobics class taught by Billy Blanks in 1995. Gretzky and Brett Hull gear up with inline hockey skates in Los Angeles following the 1995-96 NHL season. 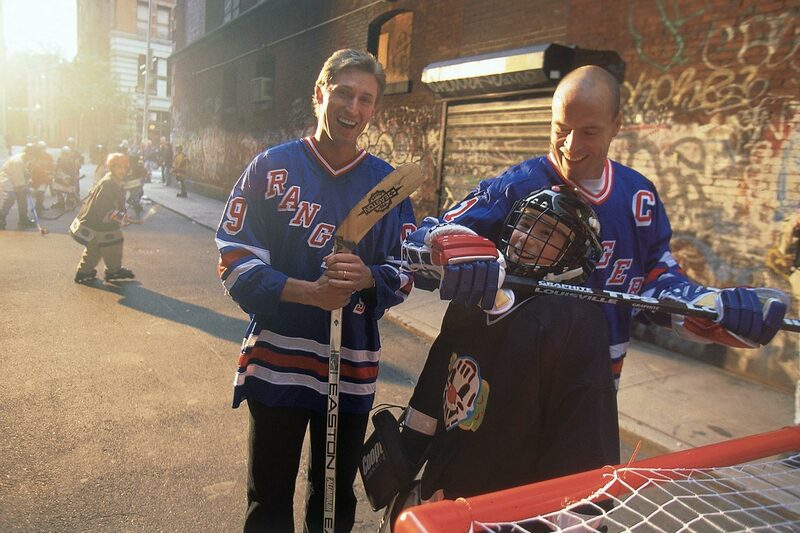 By 1996, Gretzky had moved on to the New York Rangers after a brief stay with St. Louis, reuniting him with former Oiler teammate Mark Messier. Wayne Gretzky sits with his family, wife Janet and their kids Trevor, Paulina and Ty in 1997. The Great One and his wife Janet graced the 1998 Sports Illustrated swimsuit issue. 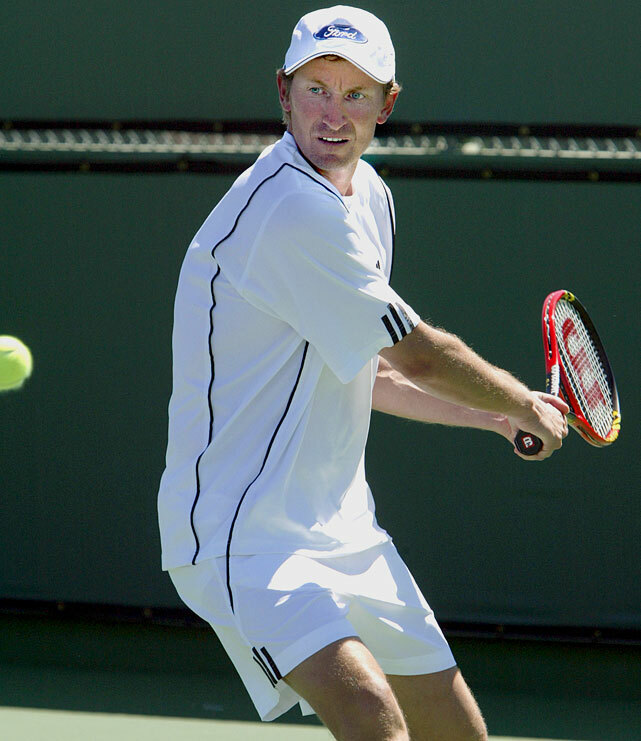 Gretzky readies a backhand swing at Indian Wells during the Pro Am Tournament to Benefit the Prostate Cancer Foundation in 2004. 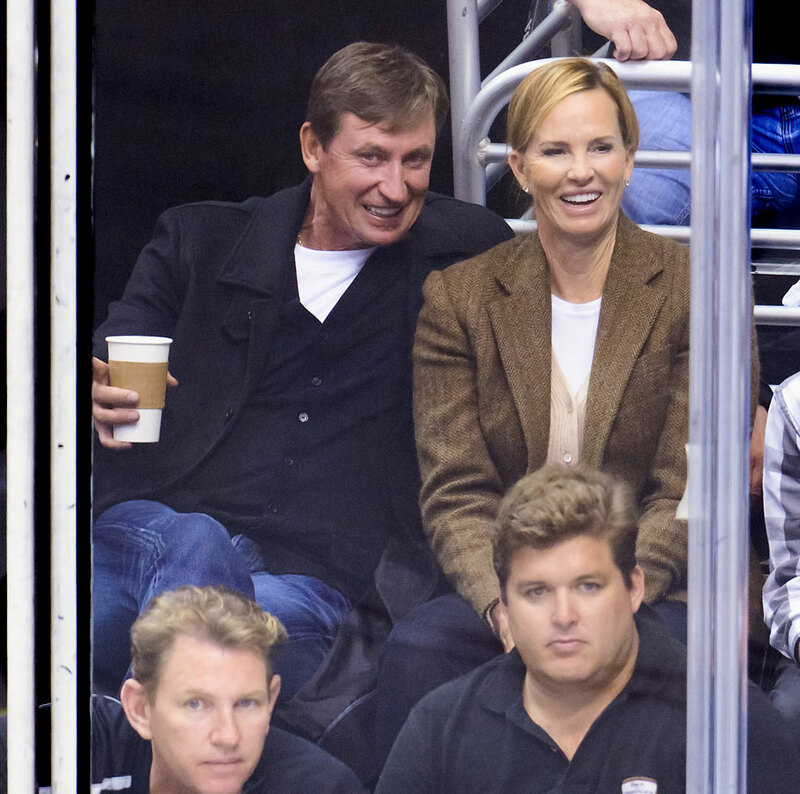 Gretzky and his daughter Paulina attend a Lakers game against the Jazz at Staples Center in 2011. Wayne and Janet take in a Kings game against the Blues at Staples Center in 2013. Pro golfer Dustin Johnson looks up to his future father-in-law, Wayne Gretzky, during a photo shoot in Los Angeles on Jan. 9, 2015. In “The Great One,” Johnson has a father figure who can teach him a thing or two about handling fame.